Welcome! Join us for Holy Eucharist on Sundays at 8 and 10 AM. Whether you’ve been to Episcopal services all your life, or this is you’re first, we hope you’ll worship in the way that is most comfortable to you. The service instructions about standing, kneeling, and other directions are intended to help clue you into the habits of this particular community. The words of our worship service are lifted from the Episcopal (and before that Anglican) tradition. The thing that sets us apart from other denominations is our dedication to Common Prayer. These same words have been used for hundreds of years by people all over the world, and are still used today. The hope in committing ourselves to this ancient tradition is that we might both learn from those who have come before, and add our own voices to the heavenly chorus. Sounds from children, young and old, are a valuable part of our prayer life – not a distraction from it! Families are encouraged to sit in the front of the sanctuary, allowing children as many opportunities to follow along and participate as possible. We offer children’s chapel for those who would prefer an offering specifically catered to children. A nursery room is available for our youngest children, operating on a cooperative model for all families. Please visit our nursery on the first floor for more information. Holy Baptism, one of the two primary sacraments of the Church, is initiation into the Christian Church. As the Book of Common Prayer states, "Holy Baptism is full initiation by water and the Holy Spirit into Christ's Body the Church. The bond which God establishes in Baptism is indissoluble." 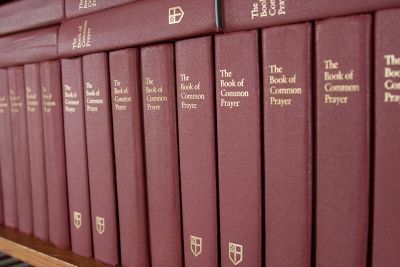 The Book of Common Prayer,1979, which has deep roots in the worldwide Anglican Communion. Funerals are held at St. Michael's primarily for parishioners and their families. Pre-planning of funerals in consultation with the Rector is encouraged. 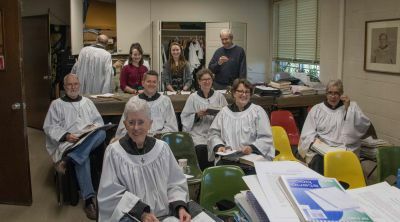 Music is an important part of our worship together. The hymns we sing are found in the 1982 Hymnal and in the Wonder, Love and Praise hymnal. During the school year our Youth Choir sings at the 10:00 AM Sunday service at least once each month, and the Sanctuary Choir sings at the 10:00 AM Sunday service. Listen to sermons you may have missed and be sure to share sermons with others! Weddings are held at St. Michael's for members of the parish and their families. The Canons of the Episcopal Church require at least thirty days' notice for weddings. Planning requirements at St. Michael's usually require several months’ notice. Please contact the Rector for more information on preparing for weddings.